DERRY GAA: We can out-Fox Tyrone claims Mallon! The Loup keeper is an avid Manchester United fan and was as shocked as anyone by Claudio Ranieri’s team but believes it shows just how much can be achieved in sport with hard work and belief. “Anything is possible, look at Leicester. And did any one expect Derry to go into Healy Park in 2006 and win? Nobody is giving us a chance but within the squad we are ready for this. We know what we are capable of. It’s going to be a massive challenge. Tyrone, alongside Dublin, are probably the form team in the country. 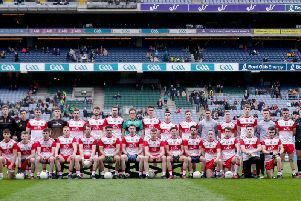 For that to happen, Derry will have to achieve something they haven’t managed in four meetings this year and something Mallon hasn’t managed in his inter-county career - defeat Tyrone. His response is simple. “The fact is those games are League, McKenna Cup. The Championship is different and this is the one you want to win. Those other matches go out the window. Give me a Championship win any day of the week over those others. The departure of Eoin McNicholl from the Derry panel means Mallon is, perhaps, the one player assured of a start against Mickey Harte’s team but things could have worked out very different had the 12-year old Thomas not been so keen to play with his brothers in the Loup under 14 side. “I was actually a bit of a play maker,” he smiles. “I was the young one in the house. I went to under 14 training and, at that age, no one wants to be keeper so I volunteered. I was only 12 but was playing with the under 14s, so was probably going to be on the bench and thought, ‘I’ll do nets’. “One thing led to another and my manager at the time said, ‘That’s you in nets for the year’ but everything has taken care of itself. Perhaps it is that ‘playmaker’ background which provides Mallon with his accuracy from the kick-out, an area which could decide Sunday’s game. In the league meeting in Healy Park, Tyrone pushed up tight on Eoin McNicholl’s kicks, denying Derry crucial primary possession and eventually strangled the Oak Leafers into submission. It was a lesson and Mallon was afforded a bird’s eye view. “Watching from the sideline in the league game gave me an interesting view. It let me see just how much they were pressuring our kick-outs. I could see the No. 10 and No. 12 pushing up. Obviously the full forward line really pressed our full-back line. It is one things we have worked on and one thing we hope will come to fruition. “It’s all down to movement. You don’t even watch the likes of Stephen Cluxton when he’s kicking, you watch the movement out the field. It comes from repetition, repetition; hour after hour on the training field. “Those Dublin boys know without thinking where they should go. You see Paul Flynn going from one side to the other two or three times and if he doesn’t get the ball he maybe goes a fourth time. And Mallon is anxious that Sunday won’t turn into another tale of missed opportunity.